With family friends from around the world, a mix of all cultures and traditions, Zara never felt beholden to the white wedding tradition. Never a fear of feeling out of place, that she’d not look the part of the bride, that family and guests would question her decision (not that I believe you should, regardless). Zara loves colour and her mind was made up, she was going to wear a red wedding dress. Her favourite flowers are poppies, and requested that poppy motifs be embroidered to the hem of the skirts and train. While poppies are delicate, flouncy and fragile, Zara’s personal style is much more modern and sleek, so instead of chiffon, 3D flowers, Poppy motifs were embroidered to the hem as drawings, marked out in burgundy, red, fuchsia and gold beads, and accented with Crystal beads around the hem and train of the removable chiffon over-skirt. The skirt was intended for the ceremony only with a longer dramatic train, the chiffon was quite delicate, but while it would have survived a night of dancing, Zara didn’t want to be concerned with carrying the train around on a loop while trying to enjoy a night of dancing. Underneath, was a floor-length skirt in the same floaty circular style, in a different shade of red silk chiffon, only it was floor length instead for convenience. The chiffon jacket was for for the ceremony only too. While Zara didn’t need to adhere to any religious restrictions, it was felt that the ballet-wrap style chiffon jacket was more suited to the feel of this part of the day. 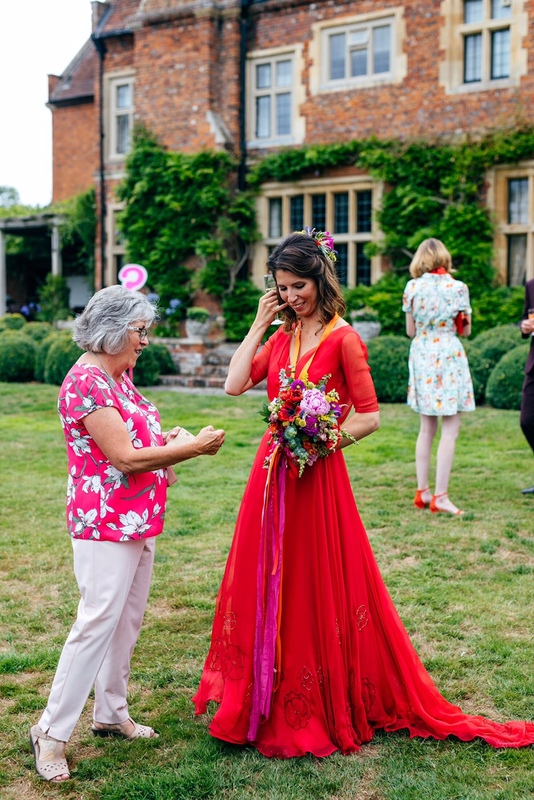 A single sheer layer of silk chiffon, matched to the embroidered ceremony skirt, with a double interwoven cross-over at the front, and above elbow sleeves, (which is such a small detail really, but I’ve got a thing about sleeve lengths - part granny-ish, part unexpectedly modern - or is it just me!?). The under-bodice is in silk crepe-satin in a deep pointed 'V'. Altogether quite balletic in style. For the evening, Zara requested a belt in pink - something fun. I made my way to the local Indian fabric shop in Tooting - a treasure trove of embellished fabrics and trims. I found some amazing trims - a bright pink velvet paisley trim, embroidered with loops of metallic gold threads, and embellished with pearls cabouchons and mirrored diamond shapes. I paired this with a second trim, also in pink, and each segment resembling the eye of a peacock feather, made in silk and metallic threads and topped with a gold faceted shape. I cut up each segment and sewed them back together in a symmetrical line to form the belt. I gathered all the various pink and red feathers I could find (which was surprisingly difficult), I think they were goose, coque and emu, and arranged and attached them along each side of the embroidered belt, longer and denser along the bottom edge than the top. Zara and Rob’s photo’s are a dream to behold, taken by Jordanna Marston, Zara’a grace is captured perfectly. Online feedback already suggests that Zara’s red dress has inspired many to ditch the white tradition, with one little girl proclaiming that she wants to dress in pink like her favourite animal - a pig!! While, why would you not!!! ?